I thought I must write to you to congratulate you on your latest achievement in ordering the closure of all universities in the country. With this decision, you will take us a step closer to becoming the ‘knowledge hub’ of Asia! I know that many people are opposed to closing the universities, SB, but I think you took a brave decision that most of your cabinet colleagues would not have taken. 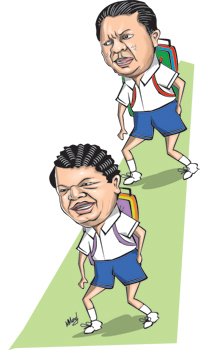 In fact, it would be like Bandula cancelling the Advanced Level examination because of the ‘Z-score’ fiasco! In fact, SB, I feel sorry for you because you seem to be at the centre of this controversy through no fault of your own. Bandula’s officials messed up the ‘Z’ score and you have been taken to task for that but Bandula is an old friend of yours, and I’m sure you wouldn’t mind the extra publicity! And of course, we know what to expect from you. You are someone who spoke your mind even about decisions of the Supreme Court. So, if a bunch of university lecturers believe that they can beat you at this game, they must be sadly mistaken. I am told that most of the problems in the universities these days are because these lecturers are demanding higher salaries. 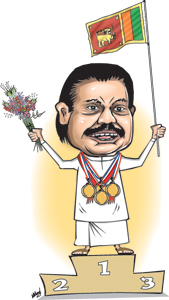 Now, at a time when Mahinda maama is doing his utmost to pay for contaminated diesel, election campaigns and international cricket tournaments, that is not fair, is it? And it is good that you shut down all the universities because, judging by what we see on television, these university lecturers seem to be spending most of their time either holding news conferences or leading protest marches, instead of teaching at their universities. So, even if the careers of thousands of undergraduates get delayed by a few months or even years, it would be good to shut down the universities for a while. At the very least, it would save us some electricity that Champika could put to good use to reduce the number of hours of the power cuts. The lecturers are also asking that six per cent of government money be spent on education. Now, SB, you must tell them to mind their own business. How can you give them that kind of money when we have to bid for the Commonwealth Games, run Mihin Air and spend money on hedging deals? These university lecturers, I am told, are also fond of saying that they are the best minds in the country and that therefore they should be paid better. They often point out that even a pradeshiya sabha manthree gets a higher salary and more privileges but I think that is not a valid argument. Surely, becoming a pradeshiya sabha manthree is more difficult than becoming a university lecturer. It is true that you have to study hard, pass through numerous obstacles like the ‘Z’ score, then study some more at university to become a university lecturer. But what most people don’t realise is that the preparation to become a pradeshiya sabha manthree is even harder. Why, you have to grease the palms of party officials, spend millions of rupees on campaigning and then fight with your colleagues for the manaapey to get elected. So, SB, I agree with you when the government says that university lecturers don’t deserve the salary increase they are demanding when all they have to do is study hard and get through a few exams — and even that is made easier when free marks are given because of errors in the question papers. In fact, I would suggest, SB, that politicians should get a salary increase instead. Why, just a few years after getting elected — and when you are still trying to recover all the money you spent in trying to get elected — you have to go through it all over again at the next elections! You don’t have to worry about such issues, SB. I am sure your re-election is assured even at the next elections, whenever that may be. That is because the wisest decision you made in your political career was to abandon the Greens and return to the Blues, where you are content to keep a low profile. 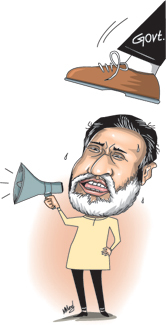 In a way, it is best that you left the Blues and returned because had you stayed with them, I am sure you would have fought with Mahinda maama to become Satellite’s successor. And if that happened, by now you would be either in jail or a senior minister — I am not sure which is better. I think that Mahinda maama has taken a wise decision to put you, a former student union leader, in charge of higher education, Bandula, a former tuition master, in charge of education and Grero, the owner of an international school to ‘monitor’ education. At last, education is on the right track. So, I wish you the best of luck in your dealings with the university lecturers, SB, although you wouldn’t need a lot of it. That is because you can count on Bandula to create a bigger impact sooner or later — and whatever you do will be insignificant compared to that! PS: It is indeed a pity that you are not the sports minister now. If you were, maybe we could have won another medal at the Olympics this year. Why, You-know-who would still be running and if you were still the minister, she would be running even harder and we could have even won the gold medal! It’s business as usual on the campaign trail!